ATLANTA (AP) Mets manager Mickey Callaway had a reason to smile at 1:40 a.m. after his team showed enough fortitude to avoid getting swept. Luis Guillorme broke a seventh-inning tie with a two-run single, Amed Rosario had three RBIs and New York beat the Atlanta Braves 8-5 early Tuesday to split a day-night doubleheader that was delayed more than 3 1/2 hours by rain. The victory snapped a four-game skid and moved the Mets to 26-25 after they fell to .500 for the first time this season. Jeurys Familia got the final out at about 1:30 a.m.
Atlanta won the opener 4-3 on pinch-hitter Charlie Culberson’s two-run homer off Seth Lugo in the bottom of the ninth. Rain delayed the start of the second game by 2 hours, 57 minutes. Freddie Freeman and Kurt Suzuki each drove in two runs in the nightcap for the Braves, who are second-best in the NL at 31-22 but just a half-game ahead of Washington in the NL East. Rosario’s two-run single off Peter Moylan in the sixth gave the Mets a 5-4 lead. Both runs were charged to Atlanta starter Brandon McCarthy, who gave up nine hits and five runs in 5 1/3 innings. New York’s bullpen rebounded after Lugo’s meltdown left Mets relievers with a 10.65 ERA in their last four games. Hansel Robles, Robert Gsellman, Jacob Rhame and Familia, in seven combined innings, allowed five hits, one run and two walks with nine strikeouts. Gsellman (5-1) got the win despite allowing a tying run in the sixth. Familia recorded six straight outs to earn his 14th save in 18 chances. Guillorme gave the Mets the lead back against A.J. Minter (3-1) in the seventh, and Rosario added an RBI single to make it 8-5. Despite the loss, Braves manager Brian Snitker liked what he saw from Minter, whose ERA rose from 2.57 to 3.74. Mets starter P.J. Conlon gave up Freeman’s two-run single and Suzuki’s sacrifice fly in the third. He allowed eight hits and four runs in two-plus innings. 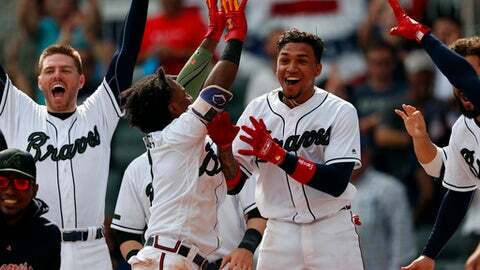 Lugo (1-1) took the loss in the first game, giving up Nick Markakis‘ sacrifice fly in the eighth and walking Johan Camargo to begin the ninth before Culberson took him deep . Devin Mesoraco gave the Mets a 3-2 lead in the top of the ninth with a solo homer off Shane Carle (3-1), but Lugo’s flop wiped out seven strong innings from Jacob deGrom, who pitched six scoreless innings before allowing Tyler Flowers‘ solo homer in the seventh. Throwing a season-high 115 pitches, deGrom gave up five hits, three walks and struck out eight, lowering his NL-leading ERA to 1.52. He has given up just two runs over his past 40 1/3 innings, a span of seven starts in which he has a 0.45 ERA. Of Culberson’s seven career homers, three have ended a game. He also has three career pinch-hit homers, but he flied out to end the sixth with the bases loaded in the second game. Mets: RHP A.J. Ramos and INF Wilmer Flores were placed on the 10-day disabled list, while Robles and C Kevin Plawecki were activated from rehab assignments. Ramos, sidelined with a right shoulder strain, and Flores, out with lower back soreness, have returned to New York for further evaluation. Jose Bautista went 1 for 3 with two walks, playing his first games at SunTrust Park since the Braves released him on May 20. Bautista is hitting .417 in his first seven games with the Mets. The former Toronto slugger had a .143 batting average in 12 games with Atlanta. Mets: LHP Steven Matz (2-3, 3.80 ERA) is 4-0 with a 2.97 ERA in six career starts against Atlanta. Braves: RHP Anibal Sanchez (1-0, 1.29) will come off the disabled list to make his third start. He’s missed 37 games with a right hamstring strain.